← “They can deliver bombs but they cannot deliver aid”. Ahmed Rashid argues that Pakistan’s unpopular civilian government should allow foreign technocrats to sort out the country’s mess – or its troubles may only get even worse. Pakistan is under siege – from flood waters that have inundated 23% of cultivable land and extremist Taliban who have killed over 120 people in the past week. Meanwhile, there is intense political infighting, calls for martial law and an economic downturn that could last for years. Some Pakistanis are also asking if the floods may just provide a wake-up call: to push the ruling elite to establish good governance, undertake real redevelopment and poverty alleviation, and ultimately strengthen democracy sufficiently to defeat Islamic extremism. However, any such hope is countered by the real crux of the current crisis. There has been a complete collapse of trust and confidence in the government and the civil-military ruling elite by the people. It would seem that years of mismanagement, corruption, bad governance and army rule, punctuated by weak elected governments, have finally taken their toll. At every turn donor countries, charitable foundations, wealthy individuals or school children inside the country or abroad are refusing to give money to the Pakistani state to alleviate the suffering of nearly 20 million people affected by the floods. At the international level, donor countries are refusing to commit money to the government, and are channelling their aid to Western and Pakistani non-governmental organisations (NGOs). Less than 20% of the aid pledged so far will go through the government, according to Prime Minister Yousuf Raza Gilani. Meanwhile, public fund raising by charities in the US and Europe is reported to be the lowest for any catastrophic act of nature in recent memory. 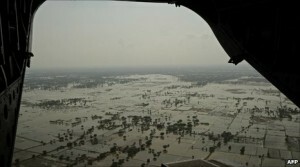 The UN appeal for $459m remains far from fulfilled – more than five weeks after the floods began. The UN said on 2 September that international fund raising had ”almost stalled” in the previous two weeks, when only $17m dribbled in to UN coffers. It seems the world has also given up on Pakistan, or at least that its government cannot be trusted by anyone. Yet, already a fight has broken out between the federal government and the four provinces as to who gets to spend the money. Meanwhile, some opportunist political leaders are calling for martial law or a French revolution. Since the floods began, there has been no genuine effort by President Asif Ali Zardari or PM Gilani to put together a truly transparent body that would receive and spend the money to the satisfaction of international donors and Pakistanis. The central government, the provincial governments, the army and even the National Assembly have bizarrely set up separate flood relief funds. And few Pakistanis are contributing because nobody trusts any of them. However, major help is on the way with international financial institutions putting together between $2bn and $3bn for rehabilitation and rebuilding the destroyed infrastructure. If such funding is truly to arrive than it is time that Pakistan’s kleptomaniac rulers restore some public trust. The politicians need to agree to set up a Trust Fund, much like that which operates in Afghanistan to fund the government, army and police. Pakistan’s Reconstruction Trust Fund could be run by a board that included the World Bank, other international lending agencies and independent and prominent Pakistani economists and social welfare figures with no ties to the government. Pakistanis would still take all the major decisions, but those who did so would not be the cronies of the president, the PM or the opposition leaders. Pakistan’s finance bureaucracy and army would have seats at the table, but certainly no veto powers over how the money is spent. Their job would be impartial implementation of recovery overseen by the Trust Fund. Such a fund would not just monitor the cash, but help the government put together a non-political, neutral reconstruction effort. It would also help plan long-term economic reforms, such as widening the tax base and insisting that landlords pay income tax. The government has not tapped the large numbers of extremely competent Pakistani technocrats, NGO workers and economists. No doubt the army and politicians would reject such an idea, saying that this would spell the end of sovereignty of a nuclear power and be intolerable for an independent nation. But the elite is already losing its sovereignty every day if it cannot put the country back together again and regain the trust of the people. The sovereignty the government has lost in the floods is the biggest loss in the country’s history bar one, when the ruling elite lost East Pakistan – now Bangladesh – in 1971. That loss was also triggered by a national calamity when there was a typhoon in the eastern part of the country as it was then, and no relief response came from the West Pakistani elite. The political infighting and threats will only get worse as the floods recede and haphazard reconstruction starts. Reconstruction left to the government will be dominated by local interests of politicians and feudal lords rather than a common, rational plan. Yet with 5,000 miles of road and rail and 1,000 bridges washed away, 7,000 schools and 400 health clinics destroyed, vast areas of the north still cut off, one fifth of agricultural land under water and the looming threat of epidemics spreading though the flood victims, a coherent reconstruction plan is desperately needed. That needs greater trust between the government, the army and the people which is just not there. Ahmed Rashid’s book, Taliban, has just been updated and reissued on the 10th anniversary of its publication. His latest book is Descent into Chaos – The US and the Disaster in Pakistan, Afghanistan and Central Asia.